Young people face cyberstalking ! Wednesday, January 30, the AMSED organized a workshop putting young people in situations in which we can all meet ! The goal was to put them face cyber-harassment and hate speech. 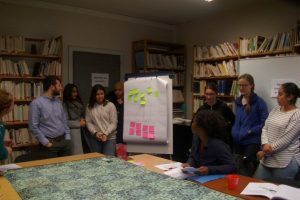 Ines, Sureyya, Ceyda, Nasim, Yasmina, Faida, Coline, Alexander, Rebecca and Paola participated in these workshops. 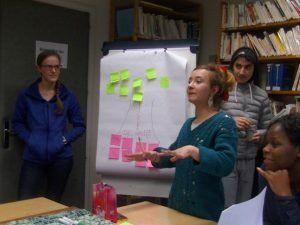 These young people, coming from different districts of Strasbourg: Hautepierre, Cronenbourg, Neuhof and Neudorf were sensitized on these subjects. First, they explored ways to defend themselves against online hate speech by examining the causes and effects. This workshop was made in the form of a game: a tree drawn, its roots are the causes of hate speech and its branches are the consequences. Next, they were asked to identify the different possible responses to harassment and cyberbullying. We looked at how people react to the scenarios and found that people had clear and different opinions. New workshops will be held on Wednesdays, we invite you to join !